Over time, the music industry has undergone various transitions and technological evolutions. Since the introduction of MP3s in the late 1990s, downloads have overtaken the purchase of physical music as customers have moved from paid content to subscription music services. Despite the industry-wide shift in consumer spending, the growth of live music looks to continue unimpeded for years to come, as real-life experiences encounter a surge in popularity. Having experienced a steady decline since the turn of the century, the global revenue of the music industry has had a resurgence in the last three years, growing from 14.2 billion U.S. dollars in 2014 to 17.3 billion U.S. dollars in 2017. In 2017, over 66 million music tour tickets were sold worldwide, marking the highest total in recent years. Additionally, the global revenue from live music tours amounted to approximately 5.65 billion U.S. dollars. U2's tour was the highest grossing concert tour worldwide that year, with their Joshua Tree Tour bringing in revenue on 316 million U.S. dollars. 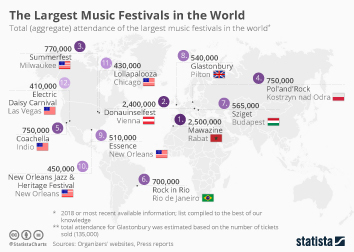 In the United States, revenue of the live music industry is forecast to gradually rise from around nine billion U.S. dollars in 2015 to almost 12 billion U.S. dollars in 2021. Americans spent an average of 22.51 U.S. dollars spent on music per consumer per annum, not including live music. Within the live music sector, live music concerts proved to be the most popular, ahead of small live music sessions and club events with a live DJ. In 2017, Canada’s total music market revenue stood at almost 570 million Canadian dollars, the highest figure to-date. Similar to the United States, admission to live music concerts was reported to account for the largest portion of expenditures on music related activities among Canadian consumers.